Varies. Dainty white wood anemones are hardy to -30C (-20F), as are 'Grecian' anemones classified as A. blanda. 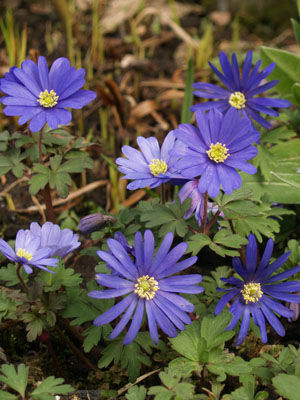 Large-flowered florists anemones (A. coronaria) are hardy only to -18C (0F) and are often grown as annuals. Soak the hard roots in water overnight before planting. Set out dormant roots in autumn where they are hardy, or in early spring, planting them 8cm (3 inches) deep. Plant in groups of three or more. Wood anemones thrive when grown in soil rich with leaf mould. They naturalise beautifully in hospitable areas. Cut anemones to use in arrangements just as the blossoms open. As the flowers fade in the garden, trim them off with scissors or secateurs.